Congratulations to "Trish", the winner in Michelle's giveaway. Thank you to all who participated! As a kid, I moved around a lot… we’re talking from one side of the country to the other and back again! And our family always drove across Canada to our new homes, which meant long and painfully boring stretches of driving time through provinces like Saskatchewan and Manitoba (no offense to those provinces, they have many beautiful areas! It’s just driving straight through that’s a beast!). You’d think that we’d all want to wring each other’s necks by the time we made it through 30+ hours of driving from Montreal, Quebec to Edmonton, Alberta, for example. Not to mention that all our family vacations involved driving, too—back across the country to visit family, or eighteen hours of driving to reach Florida, and further! On our cross-country moves, I think my family managed to get through the outrageously long drives and the limbo between houses because a living space isn’t what “home” actually means. We had each other, we trusted each other, and that’s what made it possible to endure the uncertainty and the constant disruption of moving from one place to another. For my main characters Yasmine and Noel, they have to learn the same lesson. Yasmine has recently moved to rural New York state from the fictional country of Amar (savvy readers will recognize that this country made its first appearance in my previous book! ), and Noel has just completed his twenty-one weeks of training at Quantico at the FBI Academy. That means neither of them really feel like where they are is “home,” and when Yasmine is forced to go on the run—with Noel by her side to protect her—neither she nor Noel know who to trust except for each other. They can’t go “home” and yet they don’t truly have a location to call home in the first place… all they have is one another. And let’s face it, when it comes to romantic suspense, characters have to learn to trust each other over the course of the story! Yasmine and Noel have to learn that “home” isn’t about places or things, it’s about the ones you love. But when you’re feeling out of sorts and disrupted with no true place to rest your head, that’s a difficult lesson. I relate all too well! We always cite that clichéd adage, “home is where the heart is,” but let’s face it… it’s become a cliché for a good reason. Have you ever felt displaced, or have you moved around a lot? What was it that finally made you feel “at home?” Share with me in the comments! 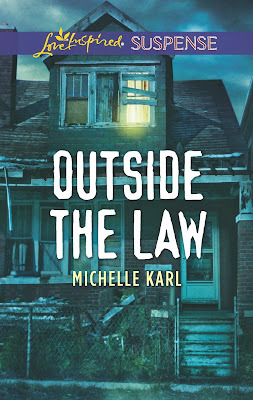 Commenters will be entered into a giveaway to win one copy of OUTSIDE THE LAW! Michelle Karl is an unabashed bibliophile and romantic suspense author. She lives in Canada with her husband, a co-dependent cat, an unflappable bunny and an opinionated parrot. When she's not reading and consuming copious amounts of coffee, she writes the stories she'd like to find in her 'to be read' pile. She also loves animals, world music, and eating the last piece of cheesecake. Oh wow, Trude! I'd say that qualifies as moving around a lot! I bet you have a ton of great stories from that time. And if you hadn't felt "at home" with each other, I also suspect you'd have gotten sick of each other in a small living space like an RV *very* quickly! There's something truly special about grandparents, isn't there? I never lived close to mine, and I do feel that I missed out a bit on making that really special connection. I have moved around a LOT throughout my life. It doesn't take much time to settle in. Usually once I have unpacked we are 'home'.